This year, so many of us are setting up ofrendas to remember our loved ones who have passed away. Betty and I thought it would be a great year to host a little photo contest on our MommyMaestra Facebook page. If your class, school, library, or group is setting up an ofrenda, we'd love for you to share a photograph of it to inspire other educators. If your family is putting together an ofrenda at home, send us a picture! Maybe it will motivate another family to remember their own loved ones with this memorial tribute. We can't wait to see all the beautiful pictures! 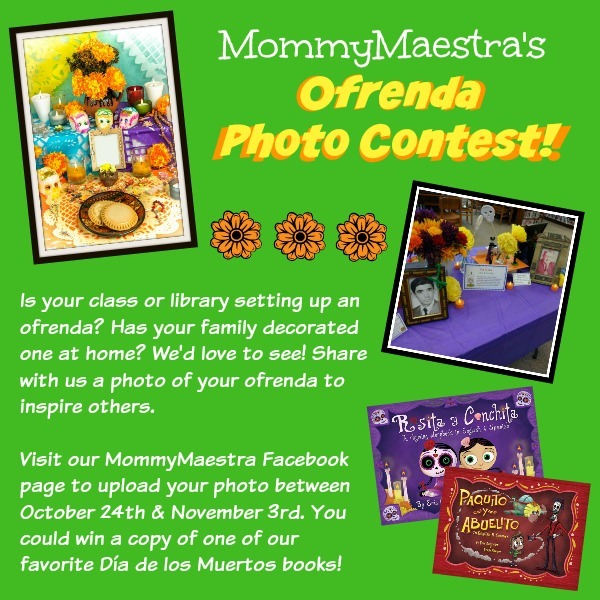 Your photo can be of the entire ofrenda, or a small part of it, but only one ofrenda picture per person may be submitted between now and November 3rd. A winner will be chosen at random to receive a copy of one of our favorite Dia de los Muertos books by author-illustrating duo Eric Gonzalez & Erich Haeger. Rosita y Conchita is our hands-down favorite story, but they've also come out with a new title: Paquito y Abuelito. The winner will be notified by tagging him/her in the contest thread on Facebook. While both Betty and I may post images, we (obviously) are not eligible to win. This contest is not in any way endorsed by Facebook.